Authors:Harry W. More, Harry W. More Ph.D., Gennaro F. Vito, Gennaro F. Vito Ph.D., William F. Walsh, William F. Walsh Ph.D. 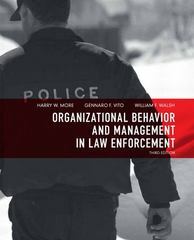 Organizational Behavior and Management in Law Enforcement 3 Edition This book provides a clear, concise, realistic, and up-to-date blueprint for successful police management. Drawing on decades of experience as practitioners, consultants, trainers and researchers, the authors fully reflect current theory and practice, while accurately capturing the “feel” of real-world law enforcement management. They focus on organizational behavior to promote a deeper understanding of both the police organization as a whole, as well as key interactions among officers, managers, and the community. This edition integrates the latest research, and presents all-new chapters on performance-based management and organizational development. It offers expanded coverage of leadership, team-building, stress management, and many other topics; as well as 39 new cases. Some key features to the new edition include: 39 new cases, 100+ new research references, and 58 new or revised Further Readings listings All-new chapter on Performance-Based Management–showing how to create work environments that enable employees to continuously improve All-new chapter on Developing Effective Organizations—including coverage of systematically building better teams and achieving better performance throughout the organization This book is for professionals in law enforcement that hold these positions: Chief, Assistant Chief, Commander, Major, Captain, Lieutenant, Watch Commander, Sheriff, and Assistant Sheriff.